Disclosure: This is a compensated post. All words and opinions expressed are 100% my own. On Saturday we got to venture out to NJ. Liberty Science Center for the first time ever to check out the Teenage Mutant Ninja Turtles Secrets Of The Sewer Exhibit, which opened up on May 28, 2016 and is open until September 5, 2016. Just in time for Summer vacation. 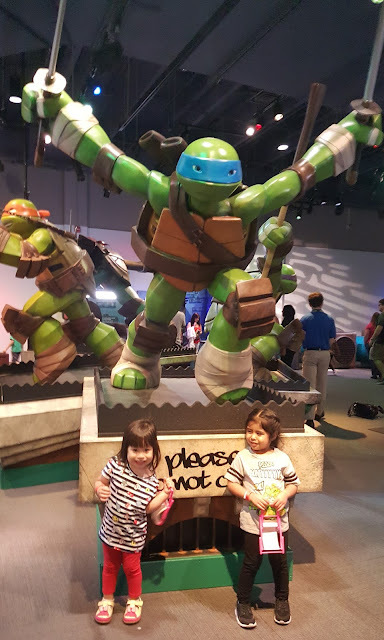 Miguel loves the Teenage Mutant Ninja Turtles and Valentina is one of their newest fans, they were both excited to check out their new lair at Liberty Science Center. Just look at that entrance, can it get any cooler than that?! Miguel having some fun with video games. Going in to the lair can be a little bit, just a little bit overwhelming because there are so many fun activities that you won't know which one to try out first. The kids decided to first have some fun with the hands on activities that involved some fun old school table games, some video games and checking out the turtles views from the lair, to name just a few of the activities. Next came some of the physical activities. Valentina loved being able to crawl through some pipes, going through a maze ninja style where we had to make sure not to trigger any alarms, this was especially fun because we could all join in as a family, adults and children alike. Miguel loved being able to practice his skateboarding skills on the balance board skateboards, with the turtles in the background. There were a lot of climbing spaces and Valentina especially loved this little fort where she could look at us via the little circle window. Valentina was like a little jumping bean, going from one activity to another. 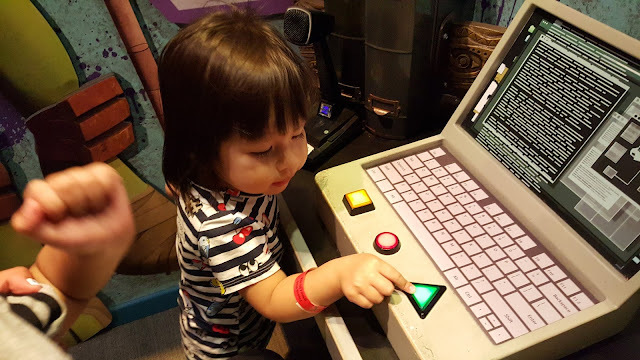 I love any activity that will promote my child's imagination and this exhibit did just that. They were challenged mentally and physically in very fun ways. Plus everything they see at Liberty Science Center they can touch. Valentina kept on trying to say cowabunga, and I couldn't help but join her. 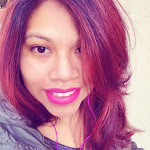 Make sure to charge your camera for all the cute pictures that you will want to take, put on your best pair of walking shoes and get ready to have a fun filled family day. Remember that this exhibit is limited time only, with Liberty Science Center being the first stop on this exhibitions first ever national tour. So make sure to grab your family and go on an adventure. You have until September 5, 2016 when this exhibit will move on to it's next stop. 1 comment on "The TMNT Secrets Of The Sewer Exhibit at Liberty Science Center"
I'd love to try the skateboarding activity!